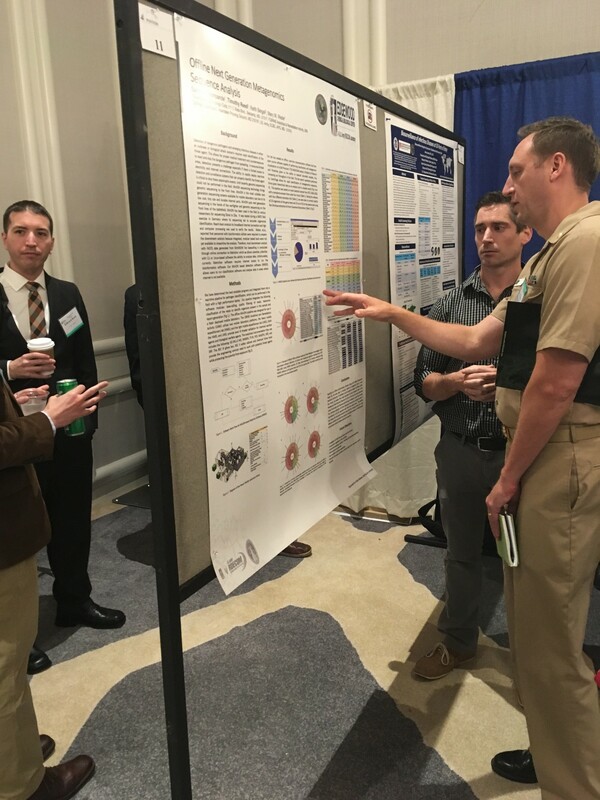 Two Army experts recently briefed government and civilian scientists in biology, chemistry and other disciplines on techniques and technology used to support and defend Soldiers from biological and chemical warfare agents. Rebecca Lewandowski, who holds a doctorate in cell and molecular biology, and Tim Reed, who has a doctorate in bio-chemistry, met with their peers at the 2018 Biodefense World Summit in Bethesda, Maryland, June 27. Both Lewandowski and Reed work for the CBRNE Analytical and Remediation Activity (CARA), a subordinate unit of the 20th Chemical, Biological, Radiological, Nuclear, Explosives (CBRNE) Command at Aberdeen Proving Ground. Earlier this year, Lewandowski completed a six month deployment as a scientist with CARA's Heavy Mobile Expeditionary Lab (HMEL) in Kuwait. She was part of a five-person military-civilian team. "The HMEL team was responsible for analyzing samples collected downrange, monitoring for use of chemical or biological agents as well as weaponized toxic industrial chemicals," said Lewandowski. "In addition to sample processing, there is a significant amount of upkeep (regular equipment maintenance and calibration) required to keep the HMEL running. We also each had individual experiments to improve our analytical capabilities." Given that this deployment was in the U.S. Central Command area of operations, Lewandowski could not discuss specific data about any analyzed samples. "Once analyzed, the information was uploaded via secure networks to databases accessible by authorities making higher level decisions," said Lewandowski. "In addition, we were also available as subject matter experts for any questions those authorities had. We worked seven days per week and every holiday, usually a 12-hour day." While most government and civilian scientists and support staff work in hard-sided buildings, the HMEL is a tent and trailer arrangement designed as a portable, high technology laboratory. To prepare the HMEL for operations, Lewandowski and the team first had to put down wooden pallets to provide a foundation off muddy or sandy soil. Once the workers and lab team assembled the structure, they were ready to provide agent identification and analysis of possible chemical warfare agents, trace explosives, toxic industrial chemicals, and bacteria, viruses and other toxins. Lewandowski, from Turnersville, New Jersey, noted that her biodefense presentation raised a number of questions and requests for collaboration with her peers. "For example, a young doctoral candidate approached me later in the week with follow-up questions regarding career paths and future opportunities. Meanwhile, a scientist who was starting a company had questions regarding what types of products work best for us given the austere conditions we operate in," Lewandowski said. "I personally believe it is valuable for those outside the Army to understand how sophisticated our military is, and that the Army has elements in place that entail highly trained scientists operating highly sophisticated instruments to identify biological and chemical threats," she added. Lewandowski has the academic background to work in this technical field and the motivation to volunteer many months overseas living and working in an austere environment. She attended Rowan University in New Jersey where she worked with baker's yeast as a model organism in studying mechanisms for gene transcription. After that, she did further research under the mentorship of Dr. Heidi Hoard-Fruchey at the U.S. Army Medical Research Institute of Chemical Defense on Edgewood to develop medical countermeasures against chemical threats. Reed presented a poster - a common data exchange and collaboration method at scientific conferences - on software that can provide identification of suspected hazards. Reed, a native of Flower Mound, Texas, completed his doctorate at Kansas University in 2008. He later worked at the Massey Cancer Center in Virginia on research targeting breast cancer cells before joining the federal government first at the Department of Homeland Security and now with CARA. 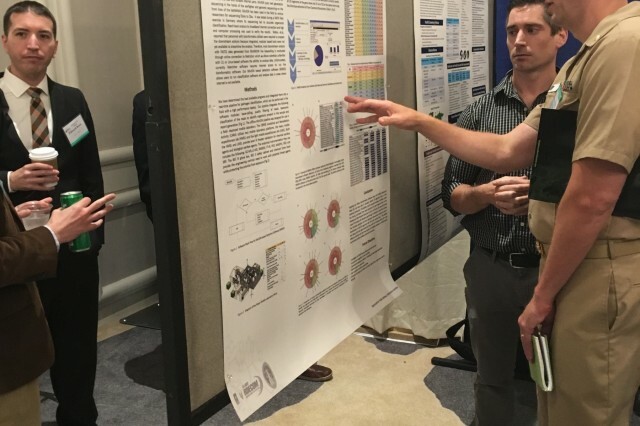 At the conference, Reed engaged his peers about his poster titled "Offline Next Generation Metagenomics Sequence Analysis." The challenge is this - how can a deployed scientist identify deadly substances in remote areas with unreliable electricity and unreliable internet access? The answer is in two parts: connect a piece of hardware called minION via a USB port on a laptop and employ a software program with a huge database for DNA identification. 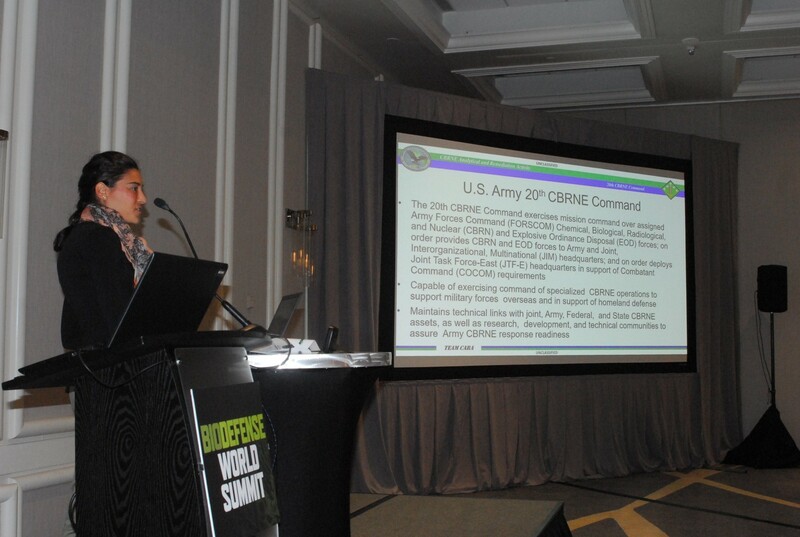 The software was built from open-source material through collaboration with Dr. Samir Deshpande at the U.S. Army Research, Development and Engineering Command Chemical & Biological Center. But how does one present an unknown substance to the computer for analysis? The minION, about the size of a large candy bar, contains an interior tube where the substance is inserted then the DNA sequencing begins and is aided by the newly developed software. The software runs through the DNA analysis to provide close to real-time detection and identification. Reed conducted experiments to confirm the ability of the software to identify substances from a small sample. Deshpande changed the code to ensure the software was compatible with CARA's offline laptop. Using the genetic information from a sample, CARA now has the capability to perform analysis, using a huge database, and identification on all organisms, bacterial, viral, parasites, and fungi, based on their nucleic acid signatures. "I had several individuals talk to me at the poster session," said Reed. "A representative from Naval Research lab was starting to use the minION in submarines. A representative from Canada's food agency was interested in the security aspects of the software as her sensitive bioinformatics information must be stored on a local laptop rather than on the internet. "Finally, a representative from Australia was looking to establish a mobile lab for their government. He also had several questions regarding the HMEL." Both Lewandowski and Reed further engaged their peers in discussions that centered on supporting Soldiers with scientific research. "Rebecca and Tim are examples of the high caliber scientists within CARA who are current in their profession and use their initiative to collaborate with others in their field - inside and outside the government," said Chris Chesney, CARA director. "We deal with dangerous and complex chemical and biological threats. Rebecca and Tim are the types of scientists the Army needs to analyze these threats to protect our Soldiers, partner nations, and the homeland."